No Missouri district in the Kansas City metropolitan area made adequate yearly progress (AYP) last year, according to the federal government’s No Child Left Behind Act. 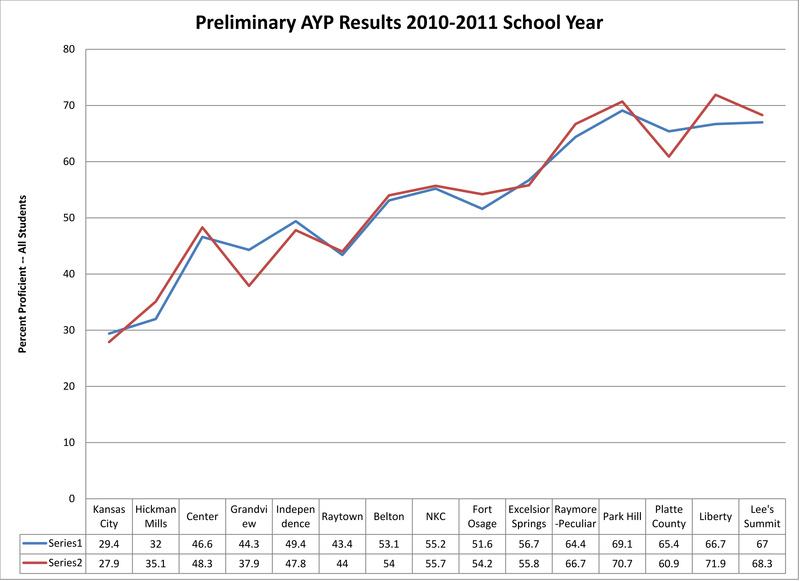 Last week, Missouri’s Department of Elementary and Secondary Education released preliminary AYP scores for the 2010-2011 school year. Schools may appeal to have data corrected, and the department plans to release a final report in September. The United States Congress, when it enacted the No Child Left Behind Act (NCLB), directed that each year public schools administer standardized tests to determine student academic achievement. Each spring, students in the Show-Me State take Missouri Assessment Program tests. Education officials use these scores — along with attendance and graduation rates — to calculate AYP. However, these tests do not appear to measure academic achievement. What they may be measuring, instead, is household income. School districts do not keep statistics on household income, but they do keep statistics on percentages of students who qualify for free and reduced-cost meals. 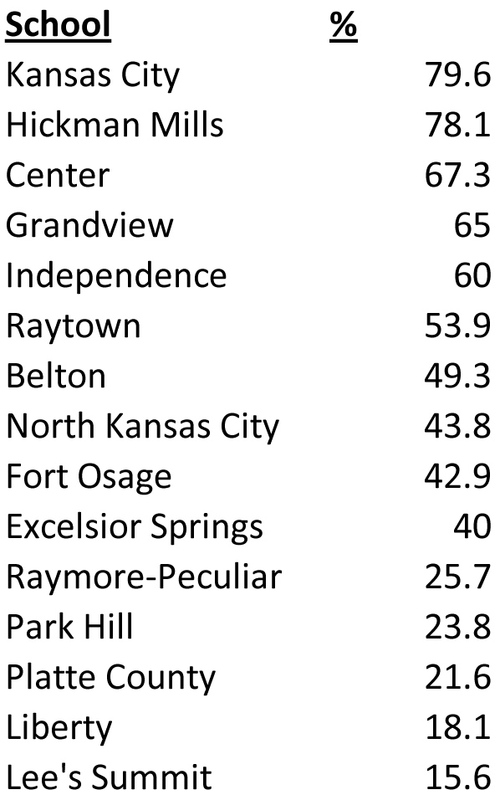 According to this measure, the Kansas City, Missouri School District has the largest number of disadvantaged students and Lee’s Summit has the fewest. The blue line represents communication arts and the red line represents math scores. According to this chart, MAP test scores are lower for less affluent districts and higher in wealthier districts. At the top of the chart, the blue and red lines represent the scores for all students. The purple and green lines — which represent the scores for students eligible for free and reduced-cost meals — mirror the first set of scores with two striking differences. First, scores for students from disadvantaged households are lower. Second, scores for all students are closer together in the districts with more lower-income families and spread farther apart for the wealthier districts. This chart could be a picture of the gap between rich and poor on the Missouri side of the state line in the Kansas City metropolitan area. If so, then what these MAP test scores on the districts’ AYP reports may be measuring is the relative affluence of students’ families rather than their academic achievement. The Kansas State Department of Education has published a list of districts and schools that did not make AYP in 2010-2011, but they have not yet published proficiency statistics. Instead of just the rich/poor gap, I did not see AYP statistics showing which schools/districts missed AYP due to subgroups like special education, ELL’s and the like. Each district/school has the responsibility to break down the stats to see where they have gaps. Free and reduced is only one of those areas. Unfortunately, I don’t find a place on the KSDE web site to find out that information for myself. Thanks for visiting the site, Janet, and for your thoughtful comment. All those statistics, broken down by district and school, are available through the Missouri Department of Elementary and Secondary Education: http://mcds.dese.mo.gov/Pages/default.aspx I chose to focus just on the wealth gap in this article. Also, I plan to try to obtain similar information from the State of Kansas. I was able to locate where that information is on the KSDE web site. 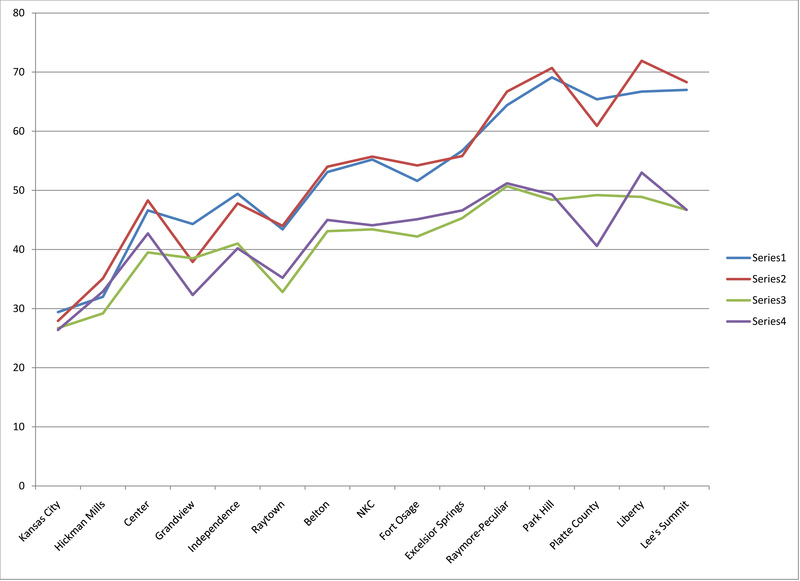 However, the 2010-2011 statistics are not yet posted. My article tonight will be a “how to” for citizens in Kansas and Missouri who want to look up information on their local schools and districts. So many schools will be misleadingly labeled as failing when in fact, they are needing to focus on their learning/achievement gaps for subgroups. As we know with NCLB, the entire school and perhaps a district, gets the slap…It’s totally misleading. Kiddos in subgroups are entitled to have interventions and supports/scaffolds that help to narrow those gaps. But it’s so sad how it comes out that schools/districts didn’t make the mark. Hard to be a teacher working your fanny off for all kids with the label. I’d love to see a chart that shows how the achievement gap for these subgroups have narrowed (or not). That should be coming in October. Hoping it’s a healthy growth. Along with your how to, you might want to sprinkle in what it truly means in a no-alarmist way. Thanks for providing this medium. Love it. Janet, would you be willing to write a short article about subgroups and the AYP? That’s a logical fallacy and a pretty shallow determination. Let’s use our OWN educations and even a little common sense about this. The test isn’t measuring affluence– it IS measuring academic achievement. But higher incomes are most often due to higher education and specialized training, while lower incomes (especially low enough to qualify a child for free lunch) are due to less education. The parents’ affluence, or lack thereof is because of THEIR education or lack thereof. That’s why there’s a relation between the number of kids on free and reduced lunch and their performances on the tests. The districts that have the poorest results in the testing, are the same districts that have the higher rates of poverty, and thus, higher numbers of kids on free and reduced lunch. If you can’t communicate very well and have poor grammar– if you didn’t graduate from high school– if you have no higher education– if you don’t have any specialized skills, etc, then more than likely you are only going to be able to qualify for a low paying or minimum wage job. Add on top of that the fact that most of the kids in these poor performing districts with higher numbers of kids using the free and reduced lunch programs, are the kids that come from single parent homes (single parents who can’t communicate very well and have poor grammar, didn’t graduate from high school and/or have no higher education, no specialized skills, etc), which is why their children QUALIFY for the free and reduced meals in the first place. So yes, there is a relationship between the kids’ scores and their parents income. But 9 times out of 10, the parents’ income is the DIRECT RESULT of the parents’ education. The test scores ARE measuring academic achievement– they just also reflect a relationship between wealth vs. poverty and education vs. the lack thereof. Educated parents tend to turn out educated children. Poorly educated parents tend to turn out poorly educated children. Of course, this isn’t a matter of fate. But it’s generally the natural progression UNLESS there’s a determination on the part of the parent and/or the child to affect a change and turn things around. JoLynne, as you know, I’ve published similar findings and, therefore, concur with your own. This is the MAP test’s legacy of discrimination. Anybody in education or finance who any longer believes that these MAP tests are anything more than a thinly-veiled effort to reinstate red-lining is kidding themselves…in districts where the scores are low, property values are depressed. Conversely, in the ‘better performing’ districts, the property values are (relatively speaking, given today’s economy) stable to increasing. It is also another way to keep what once was Democrat’s power base (teachers) under the boot, thus disempowering them…consider that when President Clinton was elected, nearly one-third of the party’s support was, directly or indirectly, attributable to teachers. This takes care of two birds with one stone: teachers are too busy trying to keep their jobs (with MAP test preparations) to be politically involved, and too scared of losing that job to make significant contributions to their candidate(s)…minorities (also a large Democratic voting bloc) are just receiving a sub-par education because school districts who are ‘poorly performing’ are held hostage by the MAP test to spending ever-increasing sums on test prep. With the embezzlement of funds from poorer districts, the test-prep companies increase their contributions to political parties they sponsor (intriguingly enough, usually Republican)…and the wheel goes ’round!